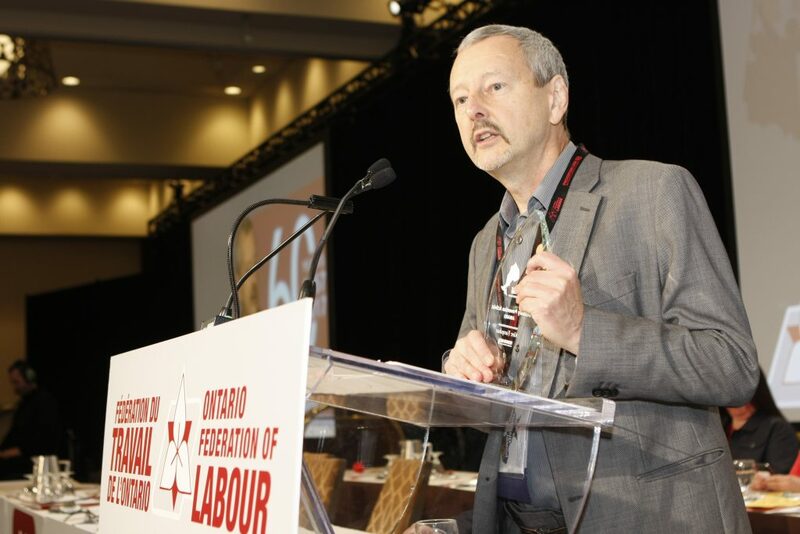 Alec Farquhar, Director of the Office of the Worker Adviser (OWA), has been awarded this year’s Prevention Link Disability Prevention Activist Award at OFL’s 2017 Power ON Convention, in Toronto. The eldest of seven siblings from Nova Scotia, Farquhar’s lobby efforts over the years have influenced legislation, policies and protocols at many levels of government in many departments, not only dealing with injured workers and advocacy for compensation for mesothelioma victims but also with prevention efforts to fight to ban asbestos to support workers’ rights to a safe workplace. The Princeton graduate and University of Toronto, Faculty of Law alum, has applied his expertise in prevention and compensation issues through positions he has held and his volunteer efforts as a sought-after speaker, educating and increasing awareness throughout the province. Farquhar’s tireless efforts and perseverance were evident as he worked closely with the labour movement to ensure that occupational disease claims were recognized and compensated, assisting and inspiring many workers and advocates. His influence leaves a legacy of activists to continue the fight for safe workplaces and fair treatment for injured workers. Prior to joining OWA in 2012, the distinguished lawyer served as Managing Director of the Occupational Health Clinics for Ontario Workers, a network of inter-disciplinary clinics in Ontario focusing on the detection and prevention of occupational injuries and diseases. Farquhar was the Director of Occupational Health and Safety Branch, Ontario Ministry of Labour, responsible for provincial level development of operational health and safety programs and related partnerships within the prevention system. He was also Director of the OWA, an independent agency of the Ontario Ministry of Labour providing free and confidential services (advice, education, and representation) to non-unionized injured workers and their survivors in workplace insurance matters and on occupational health and safety reprisal issues, on a previous occasion. Farquhar, who retires on June 1st of this year, Injured Workers Day, intends to continue to advocate on behalf of workers after a well-deserved rest. Free from the shackles of public service.